"I Need You To Keep On Believing" was the literal cry of BO as he continues his endless 4 year campaign mode swing around the country trying to hold African-Americans, Hispanics, & the youth vote together to vote on Tuesday for people who support his socialist agenda. He has also directed his attention to women & illegal aliens who sense a kill if the current congressional majorities are maintained. Illegals are coming out of the shadows (& woodwork) volunteering to go door to door in some districts. Arizona State Senator Russell Pearce reports that an illegal alien has already been elected to office in Arizona in the past. Unfortunately for BO he may run out of time before election day & may not get to the criminal vote in penitentiaries for convicts he counts on cancelling out your vote. A subscriber to ReturnToExcellence.net writes "Know you have been working hard and are very anxious about the week ahead. We have been talking to a lot of people about the election, who is running here (ugh) and sorry to say so many negative responses to actually voting! The answers are the usual, too many liars, empty promises etc. Trying to get across that in order to get rid of the politicians we don't want, you have to vote but I never saw so many negative people. Will get back to you as to who we favor right now, so much mud slinging we don't know what to believe!!" I referred the subscriber to the December 8, 2009 posting on the blog entitled "How To Vote The Bums Out." This posting is ideal for anyone who expresses the above negativity. I also recommend that everyone reread this posting plus others in December 2009 - they are a treasure trove of information that will test your courage in the voting booth. It is reported that conservatives have a greater enthusiasm to vote in this election than Democrats notwithstanding the above comment. Since April the national rate of Tea Party activists has fallen to 17% of voters from 24%. This reduction is due to people saying they are in favor of the Tea Party in principle but not in practice as they see their own government benefits in jeopardy as a result of spending cuts the Tea Party advocates. The key going forward is to analyze the size of any victories on Tuesday, especially if there is low turn out, to gage what will happen in 2012 when all of BO's community organizing skills will be put to use once again in what will surely be a high turn out election. I have identified in previous postings 11 Tea Party Senate candidates who are terrific & I hope will caucus with Jim DeMint & Tom Coburn if elected - what a difference this will make for America if they do. For instance Ron Johnson leads in the polls in Wisconsin over statist Feingold. Johnson has said that he is "not going to Washington to join a club but to join Jim DeMint in working for America." This is exactly what we need. The Comedy Central Spoof Rally on the National Mall Saturday attracted 215,000 people according to CBS (Communist Broadcasting of Socialism) - I saw the crowd live & it was impressive. In contrast the Glenn Beck rally in August attracted 87,000 people according to CBS & the 9/12 rally of 2009 attracted 77,000 as reported by FNC based on Washington DC fire department estimates. My estimate of the latter event was @ least 400,000 people based on elevator space calculations I performed - see blog posting of September 15, 2009. In any event I was stunned to watch some of the Comedy Central Rally live to see the large number of people who could possibly believe in Stewart & Colbert enough to come to Washington for this event. The crowd was youthful so our hope is that as they get older they will mature but that will not help this Tuesday if these people vote. We have first rate candidates all over the country but none finer than our two congressional FairTax supporting candidates who won their primaries in NJ - Anna Little & Mike Agosta. Both ran & won against the Republican machine in June & now are running against the Democrat machine. Anna Little has received some support from Steele & the Republican Party but Mike Agosta is an outstanding candidate who has not received any help from the Bergen County Republican Organization or the NRCC. Carol & I were honored to meet with Mr. & Mrs. Agosta in their home in August to provide a FairTax attack ad training session that was hardly needed because of their tremendous understanding of the principles of the FairTax. You could not do better than to vote for Anna or Mike if you live in districts #6 or # 9 respectively in NJ. Mike's Campaign Manager recently wrote to Carol & me that "Michael Agosta stands for a return to the Constitution and the principles of the Founding Fathers." Sound familiar? Mike Agosta is running for public office for the first time in his life to help you & our country return to excellence. As the campaigning for the mid-term elections winds down to the last few days before the election the number of attack ads against FairTax supporting congressional candidates like Anna Little have increased all over America - but we in FairTax NJ have been ready for them for quite some time. Both of our major party congressional candidates in NJ who won their primaries have been thoroughly trained in what to expect - although both of them expressed such understanding during the training that it was hardly necessary. 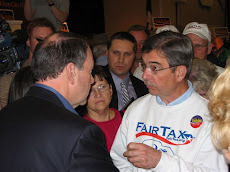 This past Saturday & Sunday nights Mike Huckabee graciously devoted the monologue portion of his TV show on FNC to combat the attack ads & to challenge any one who supports the attack ads to debate him on the purposely misleading claims of the ads versus the real principles of the FairTax. In addition below is a Press Release distributed to newspapers in Congressional District #6 to let people see the lies they have been told. 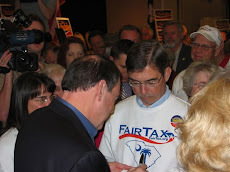 Attack ads against the FairTax have backfired against candidates in some states like Georgia when the electorate realized how badly they were being played for fools. It takes a time or two to learn all of the ropes but the more each of you do to help will only accelerate the ascent up the curve so that as quickly as we can we pass HR 25 - the most important piece of legislation in our lifetimes for America. Twenty two year Democrat incumbent Frank Pallone has been airing advertisements in which he attacks his Republican rival, Anna Little, for supporting an unnamed 23% sales tax on the middle class. The national sales tax that Pallone refers to is known as the FairTax - a bill in Congress (HR-25) with 65 cosponsors. The ads are a misrepresentation along with similar ads used by the DCCC to attack FairTax supporting candidates across the country. The ads, both false and purposely misleading, claim that the FairTax is a new tax that will hurt the middle class and are on top of all other current taxes. FactCheck.org confirms this is simply false, as the FairTax is a replacement tax. The FairTax replaces most all current federal taxes and eliminates the IRS. The facts are that the FairTax eliminates the income tax, Social Security & Medicare taxes, and death and gift taxes and replaces their revenue with a simple retail sales tax that will save $250 billion each year in tax compliance cost. Americans will then receive their entire paychecks free of federal taxes and when they spend their money they will be paying their taxes. Americans will finally see their true tax burden for the first time in generations, as the tax will appear on every sales receipt. Today, by taxing businesses and all the labor and materials in the production of goods and services, much of our tax burden is hidden in the price of the things we buy. There are substantial hidden embedded taxes in the price of everything we buy today that will be eliminated by enactment of the FairTax - such as the corporate income tax, the employers' share of Social Security & Medicare taxes, and the corporate cost of compliance. These hidden taxes are paid by all of us when we buy American produced products. To make matters worse, we pay again when we lose our jobs because our companies' products are placed at a competitive disadvantage compared to foreign produced products that are shipped to America with a minimal tax component. Rather than hurt the middle class the FairTax is a tremendous boon to the American economy including a resulting increase in jobs. The attacks by Pallone are attempts to preserve the status quo, where politicians have power never intended by our Founding Fathers. The FairTax eliminates this power by eliminating the buying and selling of tax favors which takes place under today's income tax system and corrupts our representative form of government resulting in an unresponsive and bloated government. The most interesting thing about liberal commentator Juan Williams being fired by NPR for recently expressing his feelings on FNC where he admitted he was afraid to fly on airplanes with passengers dressed in Muslim garb is that he made the exact same admission on the same FNC show (The O'Reilly Factor) shortly after 9/11 - why no outrage or firing then? Hamlet has the answer - "there is nothing either good or bad, but thinking makes it so." Over the last nine years I have often used Williams original admission to point out to many holier than thou liberals how hypocritical most statist positions are. What I have referred to since the original airing as "the Juan Williams test @ 30,000 feet" is a perfect example of a statist doctrine falling apart when it applies to them in real life & perceived possible death situations. Our marvelous congressional candidate in NJ's 6th district Anna Little had a busy Sunday last weekend. First she attended a rally with NJ Governor Chris Christie & then she participated in a debate with her opponent 22 year incumbent Frank Pallone. Please watch the debate to see exactly what America is facing as we depend on the very few people left like Anna Little for us to hang on to the principles of freedom & liberty that may only be missed by an apathetic society after we lose them. Below are three of the representative responses received re the inspirational patriotic ceremony conducted by 89 year old Navy veteran Marvin Hume @ Sunset Beach in South Jersey for the past 38 years that honors our military. I was surprised that so many people in our group have been there - but please check out the credentials I include for the first two responses & you won't be surprised @ all. Neither I nor the originator of the piece would have asked "who knew?" if we had known. Thanks for all of the responses. Carol & I plan to attend one of the ceremonies in 2011 - hope to see you there. Oh, this is lovely: we spend 2 weeks every summer in Wildwood Crest, just north of Cape May -- I've been there. And what a wonderful way to go back. God bless this good man. My Family and I have been attending that ceremony for years! It's always tearful. It's always a good idea to get there a bit early and search for "Cape May Diamonds" and then see the ruins of the concrete ship! Thanks to a subscriber to ReturnToExcellence.net for passing along this link to a very inspiring video of the ceremony 89 year old Navy veteran Marvin Hume presents each night seven days a week from Memorial Day to mid October in Sunset Beach in Cape May Point New Jersey. There have been almost 6000 ceremoinies over the last 38 years. Mr. Hume asks children to volunteer to help lower the flag. Many families reserve a night for their children to lower the flag a year in advance. The children are shown the proper way to fold the flag. All of the flags @ Sunset Beach are from caskets of U.S. servicemen. The ceremony includes God Bless America sung by Kate Smith, the National Anthem & Taps. Recommend attending if you can. As our subscriber said to me "who knew?" Tuesday's message that highlighted the indoctrination of BO, MO, & the Clinton's in the Alinsky method of community organizing in the book "Rules For Radicals" brought a deluge of internet links on the subject. I looked @ all of them. Google this yourself if you need more than the six summary points I highlight below from the links presented along with a few non-link personal responses received. Thanks to all who contributed. When Carol picked up a copy of "Rules For Radicals" for us she told me she felt she was holding evil in her hands. Just compare the positive constructive engineering feat of the rescue of the 33 miners @ the San Jose Mine in Chile to the destructive forces of al Qaeda & the attempted dismantling of America by BO & the other followers of Saul Alinsky & you have to wonder just how apathetic we are to tolerate such intrusions to the excellence that could be our constant way of life. 1. "Rules for Radicals" is written for the Have-nots on how to take power away from the Haves - the middle class. Alinsky sees his work as giving tools to the "Have-nots" so they can take from the "Haves." This principle was illustrated time & again by BO in the campaign when he said he wanted to "spread the wealth around" & that he was not interested in the amount of tax revenue generated but rather in the fairness of ability to pay that would produce an equality of the misery he planned to generate. 2. "True revolutionaries do not flaunt their radicalism," Alinsky taught. They cut their hair, put on suits and infiltrate the system from within. Alinsky viewed revolution as a slow, patient process. The trick was to penetrate existing institutions such as churches, unions and political parties.... Many leftists view Hillary as a sell-out because she claims to hold moderate views on some issues. However, Hillary is simply following Alinsky's counsel to do and say whatever it takes to gain power. Just look @ BO & you can see he is doing the same on the very few issues he pretends to be reasonable toward America. 3. BO spent years teaching workshops on the Alinsky method. In 1985 he began a four-year stint as a community organizer in Chicago, working for an Alinsky group called the Developing Communities Project. & later ACORN... Camouflage is key to Alinsky-style organizing. While trying to build coalitions of black churches in Chicago, Obama caught flak for not attending church himself. He became an instant churchgoer. The organizer (unencumbered by truth) must gain the trust of people by looking and sounding just like them. "All effective actions," Alinsky writes in his Rules, "require the passport of morality." If the "people" are church-goers, the organizer had better go to church, too. 4. Alinsky writes - "Even if all the low-income parts of our population were organized ... it would not be powerful enough to get significant, basic, needed changes." He focuses on the middle class. 5. Alinsky advises the organizer to target the middle class, rather than the poor: "Organization for action will now and in the decade(s) ahead center upon America's white middle class. That is where the power is." It's the numbers game & we lost in 2008. 6. Hillary Clinton's 1969 Political Science Thesis ("There is Only the Fight") refers to Saul Alinsky's 1946 book "Reveille for Radicals." A fallen angel made so much confusion and noise he got his own kingdom on earth. It was Lucifer. I will find the exact quote. I believe he also said the means justifies the end. There are many words from Saul Alinsky that would make blood shoot from your eyes. Rules For Radicals is their Bible. There are many references - I will say most college graduates know these rules well. The more I debate the more I see they have been brain washed - this is their connection to a utopia. Below are two of the great responses I received re the subject message. With re to the second response - for those who do not know "Rules For Radicals" is a book written in 1970 by the father of community organization Saul Alinsky - a book that was studied by both BO & his wife MO & really is the basis of their work for dismantling America. The book provides the principles that propelled BO to the White House in 2008 via organizational skills that got many previously disinterested people to the polls - people who when added up totally outnumber the rest of us. For those who do not know who Lucifer is just look it up & watch BO the next time he appears on TV. Thanks to everyone who provided a response to the original subject message. Below are four excellent insights that add to the discussion. The fourth brings the last paragraph of the original message into perspective for all of us to reflect & relate to re the future of our country. Perhaps there are under-currents that haven't surfaced with the same intensity like the issues you have addressed. There still could be "unhappy Republican overhang" from 2008. Similar to discovering a cheating spouse not everyone can forgive and forget in two years. Our elected Republicans cheated on us, they had a love affair with Democrats. True, some members of the Republican Party did kiss and make up accepting the promise from their Republican leaders they will never cheat again. But many more Republican constituents are hurting and have not regained the trust that a political marriage demands. As with many adulterers the separation may end in divorce. Congressman Frelinghuysen passed along his version of healthcare stats (below) that show how the first stages of the implementation of BO's massive government takeover falls short with respect to costs, premiums, preserving Americans' existing coverage, and providing full transparency and accountability. Data out last week show that the price of healthcare insurance is rising even faster than before, the number of uninsured Americans is spiraling upward (ask McDonalds mini-med covered employees who are in jeopardy of losing their coverage or parents of the one million children who no longer can buy "child only" insurance), & the choices people have of doctors and health plans will be sharply constrained as a result. But you can look to the current election campaigns for the best indicator - tell me one person running for office in November who voted for BO's healthcare bill that points that out in their campaign appearances? Conversely the few Democrats that didn't shout this from the rooftops. 4,103Pages of regulations issued on the healthcare law from March 23, 2010 through September 17. 12Number of final regulations not subjected to public scrutiny before taking effect. 40,000,000Companies subject to the health law's new 1099 reporting requirements, which the National Federation of Independent Business called a "tremendous new paperwork compliance burden." 9Regulations released to date that will increase premium costs for individuals and employers, according to the Administration's own estimates. 750,000Reduction in the American labor force due to provisions in the law that "will effectively increase marginal tax rates, which will also discourage work," according to the Congressional Budget Office. $310,800,000,000Projected increase in healthcare costs as a direct result of the legislation, according to the Administration's own actuaries. 7,400,000Reduction in Medicare Advantage enrollment as a result of the health care law, resulting in a loss of choice for seniors and millions of beneficiaries losing their current health plan. 51%Percentage of American workers who will lose their current health coverage by 2013, according to the Administration's own estimates. 22States that have joined legal actions to block all or part of the law from taking effect. Thanks to one of the many subscribers to ReturnToExcellence.net who I have never met but who found the blog on the internet & sent this link of a video of President Reagan talking about the dangers of socialized medicine in 1961. A longer version of this piece was posted on the blog some time ago but the backdrop photos in this one are current & educational. In the video President Reagan points out that one of the best ways of imposing socialism on a people is by way of medicine like disguising a medical program as a humanitarian project - sound familiar? Compassionate people, like Americans, do not want to reject medical care for people who can't possibly afford it & throw them out on the streets to die with no medical attention. But thinking people will also wonder what insurance-less people did before employer provided medical insurance started in the 1940s & socialized medicine began in 1965 in America under LBJ? Were there ever thousands of people dying on the streets of America or was there a different culture of personal responsibility & no incentive whatsoever for the current moral hazard that encourages people to prefer & even fraudulently game government welfare-dependent programs? The questions like those above can always be presented to lead to a desired (emotional) conclusion but President Reagan knew how to re-direct & re-state the questions because he understood that whenever he faced a seeming contradiction of what was right or wrong that it was the supposed victims who really made the injustice possible. In these occurrences he relied on one of the main principles of probably the best book he & many of us ever read - "whenever you think that you are facing a contradiction, check your premises."